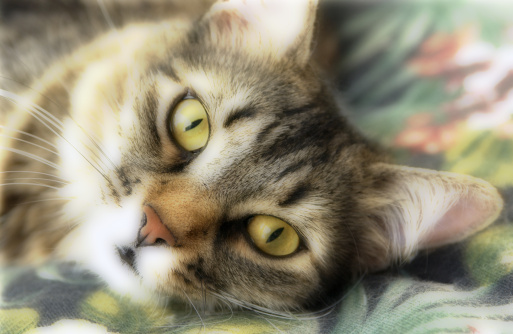 Our feline pets have numerous eye issues, some of which are similar to eye issues in dogs. Eye conditions can be considered an emergency in both cats and dogs: any squinting, watering, changes in appearance, or excessive blinking should prompt immediate vet attention. For cats, they often show a decreased appetite due to eye and facial pain, so take note of any feeding habits that seem unusual. Glance at your cat’s eyes often to be aware of what is normal so you’ll know what has changed if there is an issue. Conjunctivitis is the most common eye condition in cats. This is an inflammation of the membrane covering the inside of eyelids and a portion of the eye. Conjunctivitis is often seen with tearing or discharge in one or both eyes. Viral disease such as herpes is a common cause of significant conjunctivitis in young kittens and intermittent eye issues in adult cats. Other causes include environmental allergens, irritants, and bacterial infection. Persian, Himalayans and smoosh-face cats have a facial structure that can cause tear blockage resulting in watery eyes. This issue may need to be treated with appropriate rinses or medications to prevent conjunctivitis. Corneal ulcers: Corneal ulcers are particularly common in outdoor kitties as they are most frequently exposed to ocular hazards! Ulcers are considered damage to the cornea (clear surface of eye). This damage may be apparent or your cat may give you signs such as squinting, discharge, pawing at eye, or redness and swelling around eye. Ulcers in cats occasionally develop a sequestrum, which is a dark discolored spot seen in the eye that occurs when the cornea dies. Uveitis is inflammation of the vascular portions inside the eye. Systemic disease and severe corneal ulcers are possible reasons for uveitis to develop, although the cause can remain unknown. Signs include any change in color or size of the iris or pupil (colored and black center portion of eye), eyelid redness, sensitivity to light, eye pain, or vision loss. Uveitis can cause other issues to develop such as glaucoma (high pressure in eye). Blindness due to retinal damage: The retina is the innermost layer of the eye. Retinal disease often causes partial or full vision loss. Sometimes this loss is slow overtime. Noticing any change in the way your cat travels/acts at home can help identify this early on in disease. Retinal damage is commonly caused by high blood pressure due to hyperthyroidism, diabetes, or kidney disease. Routine checks of blood pressure for older cats by your vet are often recommended to identify elevated blood pressure before it causes damage. Viral diseases such as herpes, feline leukemia, or feline infectious peritonitis. These can be spread between cats and kittens. Vaccinating your kitten or cat and keeping them separate from unvaccinated (or outdoor) cats can help protect your feline friend from these diseases. Hyperthyroidism, diabetes, and kidney disease can also cause secondary eye conditions. As with most diseases, bringing your kitty to the vet for routine diagnostics and examination early on provides the best chance of identifying these problems before they ever manifest as eye disease.